The world of affiliate marketing has been around for quite some time now, and it continues to gain steam, since affiliate marketers can team up with companies like Amazon, with links to just about any type of product in the world. In addition, smaller companies are at an advantage with affiliate marketing as well. Why? Because several WordPress plugins are available for them to quickly setup an affiliate program and get other people to sell their products or services. Think about it. When an affiliate marketer or blogger talks about your company, they are doing you a service and sending over customers who are potentially going to pay you lots of money. So, why not give a little kickback to those who help you out? What Should You Look For In An Affiliate Marketing Theme? Affiliate WordPress themes come in all shapes and sizes. Some of them are designed more as blogs, with review tools for building confidence with your audience. Others, as we stated above, are simply online stores. Finally, some look like simple blogs, or they combine elements from all of these. Therefore, if you’re interested in making money through affiliate marketing, keep reading to learn more about the themes that will help you do it. Who Do These Themes Cater To? If you plan on making money with affiliate marketing, it’s not a bad idea to find a WordPress theme that caters to that area of business. For example, some of the best affiliate marketing WordPress themes have eCommerce looking designs to make it out like you’re running an online store. This is pretty much the case, but your items are linked to other sources, pushing folks through affiliate links that are meant to make you money. In short, you don’t have to make, store, or ship the products. At the top of the list we have the SmartReviewer theme, an option that delivers two premium designs and two additional premium widgets. The fully responsive layout has a nice combination of responsive elements, making it look wonderful for those who are more prone to viewing your content on small devices like the iPhone or iPad. Along with the responsive nature of the theme, the theme includes translation files, which can only be described as essential for most businesses nowadays. This is particularly true for affiliate marketers since you are going to be selling to people all over the world. Both PSD and HTML files are provided with your purchase, expanding customization options for those who are well-versed in coding and design. One great feature with the SmartReviewer theme is the label maker. It basically lets you customize the labels that go over your product thumbnails. So if you’d like to have a “Best Value,” or “Hot Product” label, you can do so. Three custom widgets are crucial for improving your sales on your website. They feature best rated, similar, and last reviewed products. User and review ratings are available, meaning that anyone can come on your site and write a review with a rating. This boosts your product credibility and it creates more of a community around the items you sell. Along with that, you can write your own reviews, acting as somewhat of an authority on the site. If you preview the theme, you’ll notice that plenty of demo content is included with the preview. If you’re looking to start your website with all of this content, simply upload the demo content that’s included with your purchase. Overall, the homepage looks similar to Pinterest, in that the grid-based design has tons of products shown on the front page. Therefore, users can see quick ratings, images, and information about each product before clicking through. You also gain access to a little menu at the top, prompting people to go to your contact or About Us pages. Overall, the SmartReviewer WordPress theme is a viable option for all affiliate marketers, since it provides a widget-based layout and a modern design for making referrals to your products. Try out the REHub theme if you’re interested in an effective moneymaking theme with a list builder. This list builder is great for generating lists and showing people which products are best in certain categories. The comparisons work wonders for helping customers find out which items are best for their needs, while the promotional codes ensure that everyone gets the best deals available. Filters are also provided for navigating quickly around your site and only showing the items that are most relevant to customers. For example, a user may only want to see women’s clothing. In this case, they can click on the filter to remove anything that is catered towards men. A full directory is provided for users to make submissions and people can even build their own profiles for featuring their own content on the site. The enhanced user review system is fairly easy to play around with because it has star ratings and comment boxes, similar to what you see on places like Amazon. What’s cool is that you get an enhanced WooCommerce affiliate program, allowing you to integrate with the popular plugin. Monetization is available through various other plugins as well. You can connect with the Easy Digital Downloads plugin for selling digital products. We like that you can connect your posts to offers, with descriptions and reviews of the items you’re recommending. Add a full catalog of your items and organize them into categories. Use the ad modules to bring in even more money for your company and to feature companies that sponsor you. Speed optimization is a key area that the developers focused on with this theme and the responsive layout goes well with this speed, so people can quickly bring up your articles and recommendations on smaller phones and tablets. People can log in to your site by clicking on a button and they can go to the search bar to locate more specific items that they aren’t able to find right on the homepage. Along with an email subscription form and tons of places to feature high-resolution images, the REHub WordPress theme is a wonderful choice for affiliate marketers in need of lots of features. 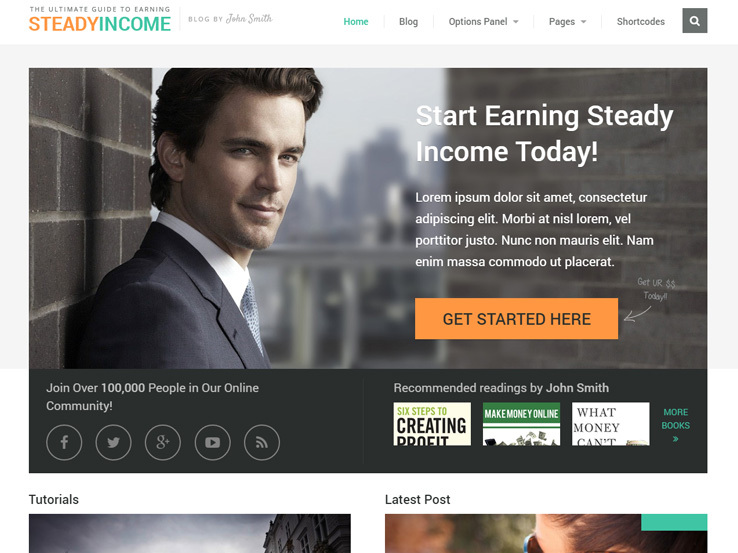 The SteadyIncome WordPress theme starts out its feature set with a powerful subscription tool, allowing you to collect subscribers who would like to pay you for your services or products. Ad optimization is a huge advantage when you go with the SteadyIncome theme. You can partner with companies that are in your area for affiliate marketing. Or you could integrate the AdSense tools in order to get more targeted marketing. The featured products section shows all of the items that are most likely going to be your best sellers. This is known to boost your sales since people don’t have to go searching for the products that are most popular. Along with that, the responsive design brings you into the modern world of web design since you can’t expect to gain any traction with content that people can’t view on smaller devices. Build your own brand by quickly uploading a logo from the backend and changing your color combinations. Also, use the prominent social media icons to expand your reach online and chat with people through places like Facebook and Twitter. The featured product display is a nice bonus and the latest blog post list keeps people on your site for a longer period of time and it shows search engines that you’re sharing quality content with users. The partner logo sliders are ideal for displaying exactly which companies are working with you. These assist in building your credibility, while also giving credit to your partners. The newsletter subscription box is one of our favorite features in the SteadyIncome theme because it helps you collect email addresses and send out newsletters when you have new reviews or products to recommend. Several unique widgets are provided on the backend, turning your design area into somewhat of a drag and drop interface. For example, you can talk about the primary blogger or include social media buttons in the footer or sidebar. The engaging design is proven to boost your conversion ratings and the mega menu compatibility is a nice bonus for those who would like to have tons of pages on their website. 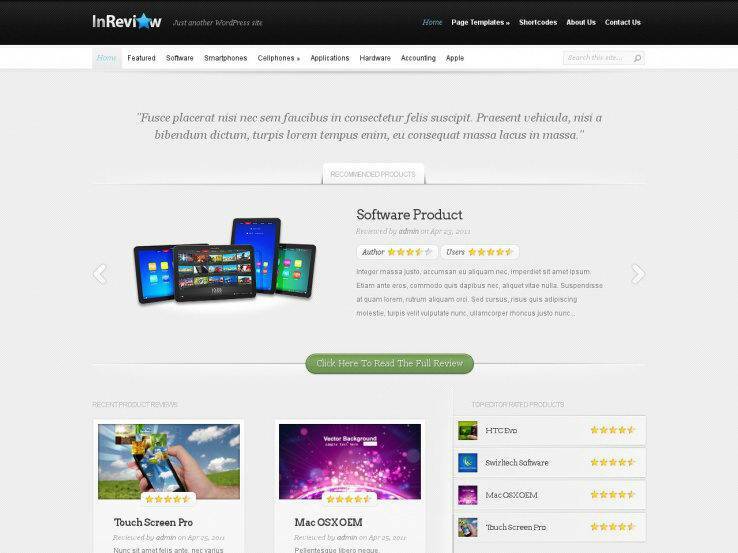 The InReview WordPress theme is a fully-functional rating WordPress theme from the folks at Elegant Themes. Ratings are available for both you and the users and the custom widgets improve your design options, considering you don’t have to spend much time in the source code. 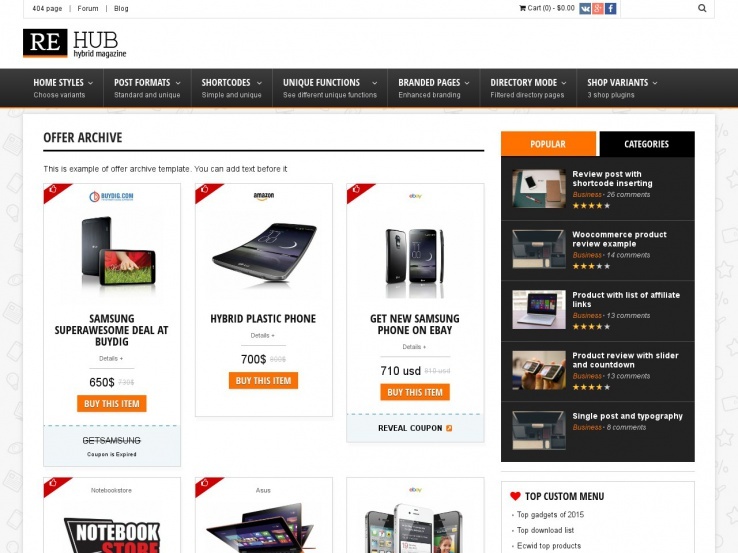 In addition to that, the theme allows you to integrate it with various affiliate programs. We like the author ratings and the complete localization is nice for connecting with more customers from all over the world. Choose from five unique colors to expand your branding options and use these to make your website different from other companies that select this theme. 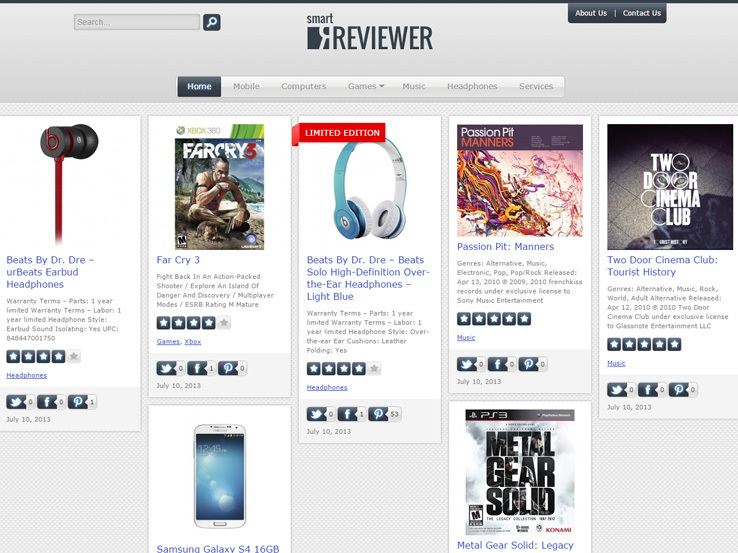 Along with shortcodes, page templates, and more, the InReview theme is quite the helpful theme. 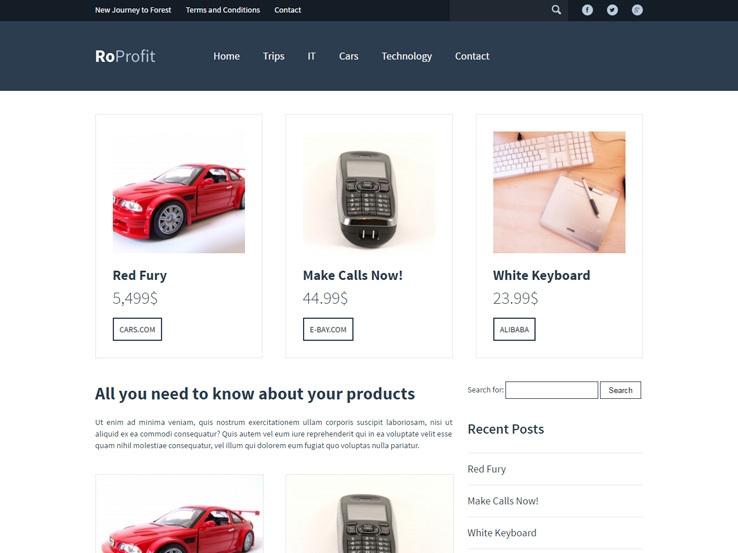 Consider the RoProfit WordPress theme if you’re looking for a simple and clean layout for your affiliate marketing. The blog module allows you to make your own reviews and talk about the products that your customers are thinking about buying. After that, you can link to the affiliate programs for a more credible version than just trying to push the items and services on people. The theme is completely responsive and it comes with custom widgets for organizing your homepage in a professional manner. The unlimited color choices are ideal since not every company is going to want the same color for the branding. Along with that, the theme includes an advanced slider for showing off imagery and a beautiful rating chart for putting numbers to the ratings you make. For example, you can break down your ratings into multiple categories to give a better idea of what you think of a product. The Compare WordPress theme delivers an impressive dynamic for your website, as it provides a clean and modern design that is built to attract more visitors. The responsive layout works and looks great even on mobile devices and the price comparison functionality is exactly what you need to improve how your users view certain projects. Custom widgets are included for dragging and dropping elements on your homepage. One feature we particularly enjoy is the set of shortcodes. These are used so that you rarely have to use the code. Beginners and advanced users find this useful since you can create items like buttons and columns, all without knowing anything about coding. Localization support improves how many people you can reach out to, since not everyone speaks English. 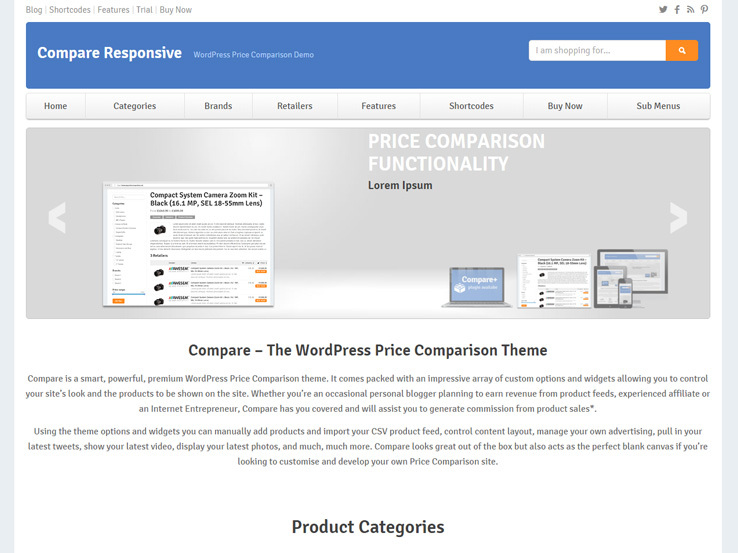 Overall, the Compare theme handles affiliate marketing rather well. 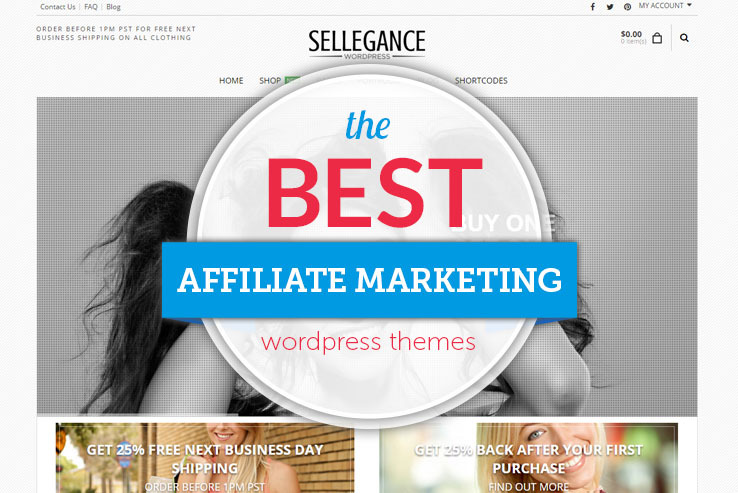 This is a huge collection of WordPress marketing theme. I have chosen ‘expert’ theme for my blog. I have taken a decision to buy this theme as soon as possible. Hi Palshtd,\n Thanks for sharing! What made you decide on Expert for your blog? Please update the themes list as the AffiliateBoard Theme is now discontinued. And the clipper and the Daily Deals themes are awesome as i am using them. Hi Lokesh,\n Thank you so much for pointing this out! We will update it shortly.